Emergence from the Shadow: First Peoples’ Photographic Perspectives was curated by Jeffrey M. Thomas and presented from 22 October 1999 until 6 January 2002 in the art gallery of the First Peoples Hall of the Canadian Museum of Civilization. The contemporary works in the exhibition reflect the legacy of early photographic experimentation in the 1980s. Artists like Shelley Niro and Greg Staats were part of this first wave of aboriginal contemporary photographers, and their artistic vision laid the groundwork for a new and critical response to a history that had included the faces of First Peoples, but not their voices. By contrast, contemporary artists like Mary Anne Barkhouse, Rosalie Favell, Barry Ace and Greg Hill confront the urban realities of today’s First Peoples. Rather than perpetuating imagery from the past, they address complex contemporary social issues through their creation of photographic works of art. View Canadian Museum of History’s archived website here. I chose the title Wassechgan (window) as a metaphor from which to view the lives of my family through the historical photograph. Perhaps more poignantly, I chose to honour those individuals whom I felt have been a constant force in shaping my own personal identity, history and ancestry (Anishinabe (Odawa)/British). It was also an opportunity to shed some light on the lives of those who many may consider insignificant, yet unequivocally are individuals who have contributed immensely to our collective humanity and whose lives are equally valid to any who have left their mark on the annals of history. When viewing historical photographs, whether familiar or not, there is an innate need, desire and passion to try to fill in that negative space, driven by our desire to understand. If we are fortunate, there is enough pertinent information to guide us. If not, then we are left to our own inquisitive nature and imagination. Often, we are moved by a particular photograph, and the image becomes entrenched into our memory. How can a fleeting moment captured in time well up such a plethora of emotions? Why do we romanticize about situating ourselves within a particular historical space? How can we ever arrive at a truth? These questions and others arise when I view historical photographs, especially those of Indigenous peoples. Public archives, museums, libraries, antique shops and numerous other public and private collections are filled with such images. Although many prominent individuals are identified in the photographs, many lesser known are not. Yet, the latter have also lived their lives through great political, cultural, social and spiritual change, and their lives are equally integral to a deeper understanding of who we are, where we come from and where we are going. It is my hope that Wassechgan will fill in a portion of that negative space and reveal the “significance of the insignificant” by providing an honouring space and testimonial to the lives that once were. I began my genealogical research in 1985, a year that marked my parents fortieth wedding anniversary and the passing of my grandmother in her eighty‑fifth year. I began to collect family photographs and accumulate as much information about who was in the photograph, where and when it was taken and what event marked the occasion. Over the course of several months, I made copy negatives of over one thousand assorted photographs. I reprinted and retouched the prints by hand and chronologically arranged them, before transferring them onto video tape. In celebration of my parents anniversary, my brother and I invited family and friends, and together, we watched the video. I will never forget the laughter, tears, stories and recollections that flooded the room for more than an hour. It was the first time, we had gathered together to talk about our collective history through the photographic image. It was truly an historic and significant family event that not only honoured those individuals still with us, but also paid tribute to the memory and contributions of those who had passed before us. Although each and everyone in my extended family are important, I chose to include only seven people in the installation. Seven individuals whom I felt embodied wisdom, respect, bravery, honesty, love, truth and humility. I chose these traits based on an Anishinaabe teaching that recounts a story of how these guiding principles were brought to us by Seven Grandfathers. I associated each person with one of these gifts. As a point of entry into each of their lives, I asked everyone to contribute a meaningful personal object for the installation; something that sparked personal memories for them. Like the photograph, these objects act as signifiers, triggering memories of people, places, stories and events. To introduce the installation, I chose my parents’ wedding portrait, taken in Birmingham, England, in 1945. The photograph is in its original frame with an inscription “For King and Country”. The photograph offers little information, other than it was the end of World War II, and it marked the joining in matrimony of a Canadian Indigenous soldier and an English woman. I thought it was an ideal starting point to fill in that negative space and trace the circumstances surrounding my family’s historical past and future together. 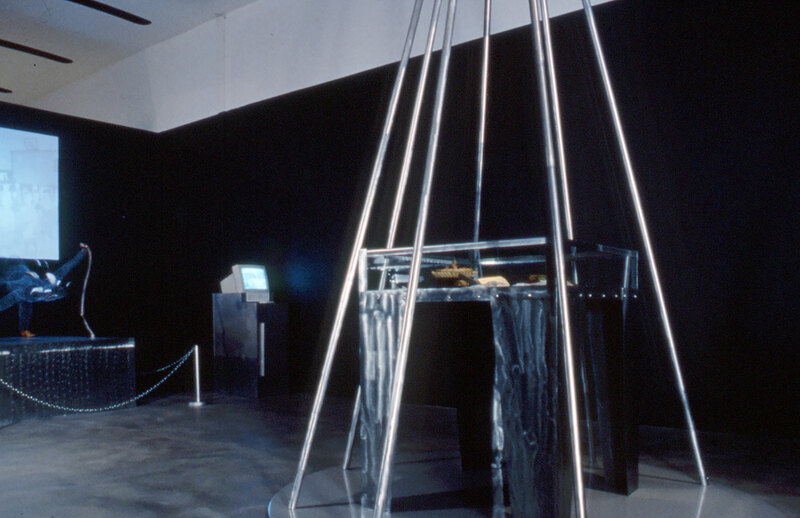 Seven steel poles form an apex directly over a metal and glass display case as a metaphor for my family’s lodge. Each pole represents one of my seven family members and is a metaphor for their individual and collective strength. 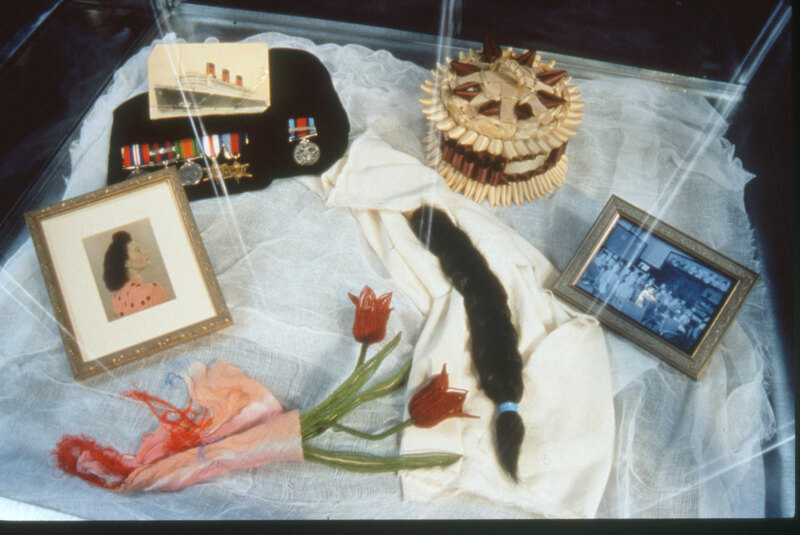 Seven objects are arranged on cloth as a metaphor for a sacred medicine bundle; my father is represented by WWII medals; my mother by a post‑card of the Queen Mary; my brother by a school photograph; my great‑aunt by a splint ash basket; my other great‑aunt by a hand‑coloured portrait; my cousin by beaded flowers; my grandmother, who is now deceased, by an artificial braid of hair. Each object is a window into their lives, where the object is metaphor for personal memory and sacred gift. Since the installation is a tribute to the life and contribution of these seven individuals, I chose to situate myself on the periphery. 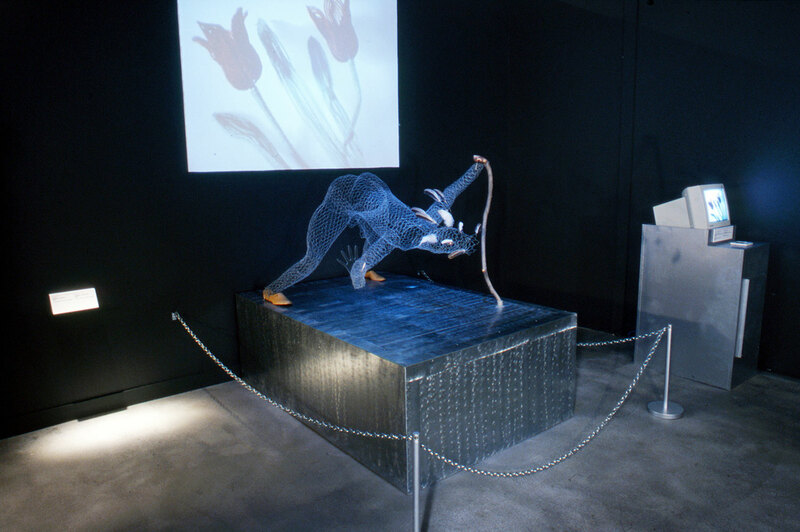 I reference myself through the wire sculpture of trickster/storyteller Nanabush for in Wassechgan, I am the storyteller, providing a brief glimpse through one of many possible windows. 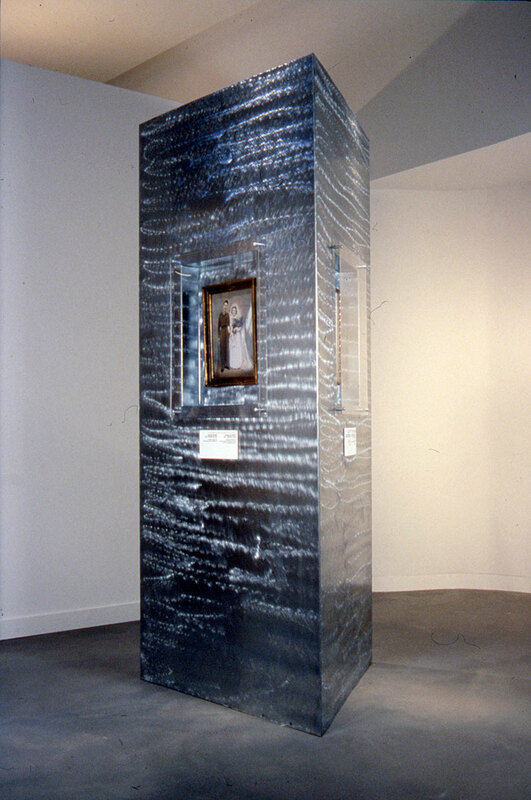 Wassechgan (1999) in "Emergence from the Shadows: First Peoples' Photographic Perspectives", Canadian Museum of History (formerly Civilization) Gatineau, Québec. Wassechgan (1999) in "Emergence from the Shadows: First Peoples' Photographic Perspectives", Canadian Museum of History (formerly Civilization) Gatineau, Québec (detail). 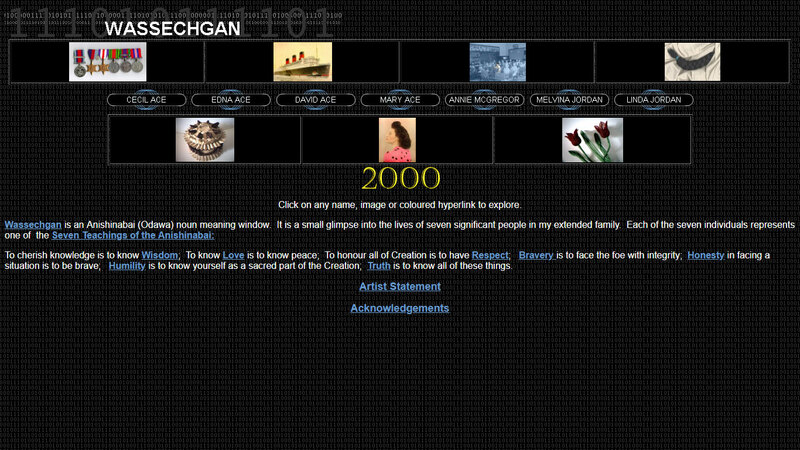 Screen Capture of "Wassechgan" (1999) website for an interactive kiosk as part of the installation for "Emergence from the Shadows"